A recent article published by the Mayo Clinic outlines the tie between stress and negative self-talk. As someone who has never considered myself to be athletic, largely due to my very negative experiences in my grade school gym classes, I have found myself engaged in frequent negative self-talk. My grade school gym teacher was tough, and some of us even labeled him as just plain mean. He left me and several other classmates feeling incompetent and uncoordinated. In grade school, I was one of those who was always picked last for the team. Looking back, I dreaded gym days and often had a stomach ache that kept me home from school or landed me in the nurse’s office, just to avoid the anxiety-provoking class. Ironically, when I changed schools in 7th grade I was one of the best students in gym class – all of the years of hounding and competition had made me pretty good at sports but unfortunately, the damage had been done and 2 years in a new school couldn’t undo the lack of competence that I feel when I have to participate in a team sport. To this day, I feel anxious when the PRA Olympics is approaching. As much as I enjoy it once it gets underway, that fear of letting the team down or doing something stupid still lingers. In 2014 when I began running, I started to notice how often I would think negative thoughts about things like my pace, what I ate the day before, or how often I failed to work out. As I discussed this with other runners we all agreed that we are way too critical of ourselves. With this in mind, I began to actively change my thought process. Instead of chiding myself for not getting enough sleep and dwelling on it throughout the run, I acknowledge what might be making my run difficult that particular day but then offset those thoughts with a reflection on an accomplishment – like the day I ran in 87-degree heat and 95% humidity – great job. As silly as it seems, I’ve also come to love other positive reinforcements, including one of my running shirts that says “I can and I will” and the first song on my running playlist right now, which has the chorus “it’s my day to be brilliant.” These things also help to keep me positive. In a podcast I recently listened to, the topic was about providing constructive feedback and in doing so, considering what we want the outcome of our feedback to be. I believe this should apply to the feedback that we give ourselves as well. What is the point of critiquing ourselves – is it to berate ourselves or is it to learn from our mistakes and try to do it better the next time? I’m now also putting this into practice in other areas of my life and being kinder to myself about my eating practices and wellness routine. Instead of criticizing myself for making a mistake, I’m trying to pinpoint why I made a choice to eat more than I should or why I stayed up late reading my book. I acknowledge it, try to figure out a plan to avoid doing it the next time, and move on. 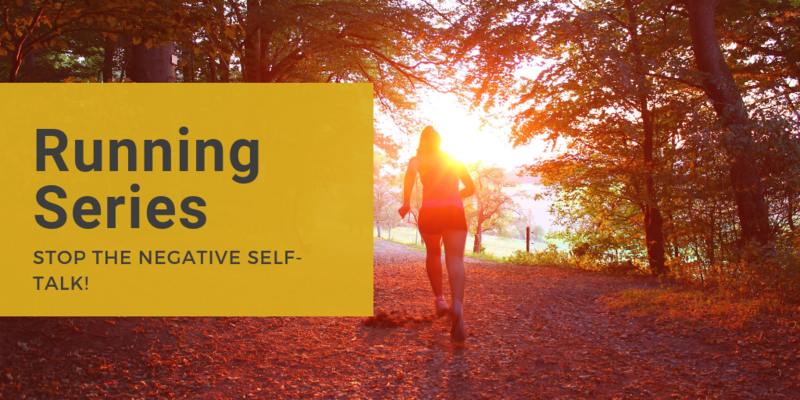 It seems that if I’m not beating myself up, I am less likely to self-sabotage, and more likely to learn from my mistake – and when I do this, I’m reducing my stress!